Education: Draining Lake & Down the Plughole model of MS.
How do you explain MS? This is a favourite pastime of ProfG who will sit on a beach pondering the meaning of Life, the Universe and Everything MS. It is apparently not only ProfG’s pastime spent dreaming but also some of his colleagues like to do this. Relapses and progression contribute to multiple sclerosis (MS) disease course, but neither the relationship between them nor the spectrum of clinical heterogeneity has been fully characterized. A hypothesis-driven, biologically informed model could build on the clinical phenotypes to encompass the dynamic admixture of factors underlying MS disease course. In this medical hypothesis, we put forth a dynamic model of MS disease course that incorporates localization and other drivers of disability to propose a clinical manifestation framework that visualizes MS in a clinically individualized way. The topographical model encapsulates 5 factors (localization of relapses and causative lesions; relapse frequency, severity, and recovery; and progression rate), visualized utilizing dynamic 3-dimensional renderings. The central hypothesis is that, like symptom recrudescence in Uhthoff phenomenon and pseudoexacerbations, progression clinically recapitulates prior relapse symptoms and unmasks previously silent lesions, incrementally revealing underlying lesion topography. The model uses real-time simulation software to depict disease course archetypes and illuminate several well-described but poorly reconciled phenomena including the clinical/MRI paradox and prognostic significance of lesion location and burden on disease outcomes. Utilization of this model could allow for earlier and more clinically precise identification of progressive MS and predictive implications can be empirically tested. This idea is published in a high brow journal, but it is interesting that the idea is presented as a metaphor, which is essentially a draining lake. Perhaps sad to see that neuros need pictures to explain things:-). and you may find it interesting an help explain MS.
Central to this model is the observation that progression clinically recapitulates a patient’s prior relapse symptoms and unmasks previously clinically silent lesions, incrementally manifesting above the clinical threshold a patient’s underlying “disease topography.” The recapitulation hypothesis central to this new clinical framework may better elucidate the drivers of disability accumulation and could allow for earlier and more clinically precise identification of progressive MS. The topographical model of MS visualizes the CNS as a pool divided into 3 basic anatomical regions with increasing amounts of functional reserve. MS lesions are represented as topographical peaks that rise up from the pool base. Localization of lesions is visualized by plotting lesions on an anatomical grid with lateralization grouped across the 3 key regions: (1) the spinal cord and optic nerves occupy the shallow end, (2) the brainstem and cerebellum comprise the middle; and (3) the cerebral hemispheres constitute the deep end of the pool. (A) Clinical view: water is opaque, only above-threshold peaks are visible. (a) Above-threshold topographical peaks depict relapses and quantified Expanded Disability Status Scale/functional system disability measures. Each peak yields localizable clinical findings; the topographical distribution defines the clinical picture for an individual patient. (b) Water level at outset reflects baseline functional capacity and may be estimated by baseline brain volume. (c) Water level decline reflects loss of functional reserve and may be estimated by metrics of annualized brain atrophy. (B) Subclinical view: water is translucent, both clinical signs and subthreshold lesions are visible. (d) Subthreshold topographical peaks depict T2 lesion number and volume. (e) The tallest peaks (i.e., the most destructive) in the cerebral hemispheres are shown capped in black as T1 black holes. Lesions arising from the more eloquent shallow end cross the clinical threshold more readily than those arising from the deep end. This is consistent with the relative predilection for partial myelitis, optic neuritis, and brainstem syndromes that typify MS relapses. A top view of the model emphasizes lesion location and distribution, akin to an MRI (figure 2). In this view, the topographical distribution of lesions is shown in the anatomical grid, grouped across the 3 key regions with lateralization, replicating a distilled MRI perspective. Both T2 lesions and a representative T1 black hole are shown. (A) Top (clinical) view: water is opaque, only above-threshold peaks are visible. (B) Top (subclinical) view: water is translucent, subthreshold lesions are visible. As a depiction of clinical functional capacity, the water encompasses both CNS structural integrity and dynamic physiology. The clinical threshold is not static, as indicated by the small waves and fluctuations at the water’s surface. The gradual decline in the water level depicts the chronic depletion, or diffuse loss, of CNS substrate that occurs over decades. Thus, in the long term, functional capacity, or reserve, may be best assessed and quantified chronically by metrics of brain volume and brain atrophy. Still images from 5 key time points in this 20-year clinical course depiction are shown. (A) RIS: lesions emerge as topographical peaks that are apparent as T2 lesions on MRI but have not crossed the clinical threshold. (B) CIS: the first lesion (circled) to cross the clinical threshold denotes CIS. Lesions arising in the shallow end are more likely to cross the clinical threshold, as there is less functional reserve in these regions. (C) RRMS: the emergence of subsequent subthreshold lesions defines RRMS by the McDonald criteria. The second clinical relapse (circled) defines clinically definite MS—in this example, a brainstem attack. Additional lesions denote ongoing disease activity, i.e., “base effects.” (D) SPMS is characterized by a gradual decline in functional capacity, revealing the underlying lesion topography above the clinical threshold. Disability is driven here principally by the dropping threshold, i.e., “surface effects” (downward arrow). Progression takes the form of a patient’s particular disease topography, unmasking existing deficits and recapitulating symptoms of prior relapse—in this example, multifocal myelopathy and brainstem/cerebellar signs. (E) SPMS with activity is demonstrated by a new relapse (circled) occurring in the context of progressive disease. CIS = clinically isolated syndrome; MS = multiple sclerosis; RIS = radiologically isolated syndrome; RRMS = relapsing-remitting MS; SPMS = secondary progressive MS. The model conceptualizes relapsing and progressive contributions to disease course along a continuum: an individual’s disease course can be driven predominantly by relapses, or predominantly by progression, and those with very mild or stable disease may demonstrate neither. Each archetypal disease course is shown at year 5 and year 20. (A) Relapsing-remitting MS with early secondary progressive disease: relapsing disease transitions to secondary progressive MS with disability being driven in the early years by relapse (“base effects”) and in the later years primarily by the declining threshold (“surface effects”). 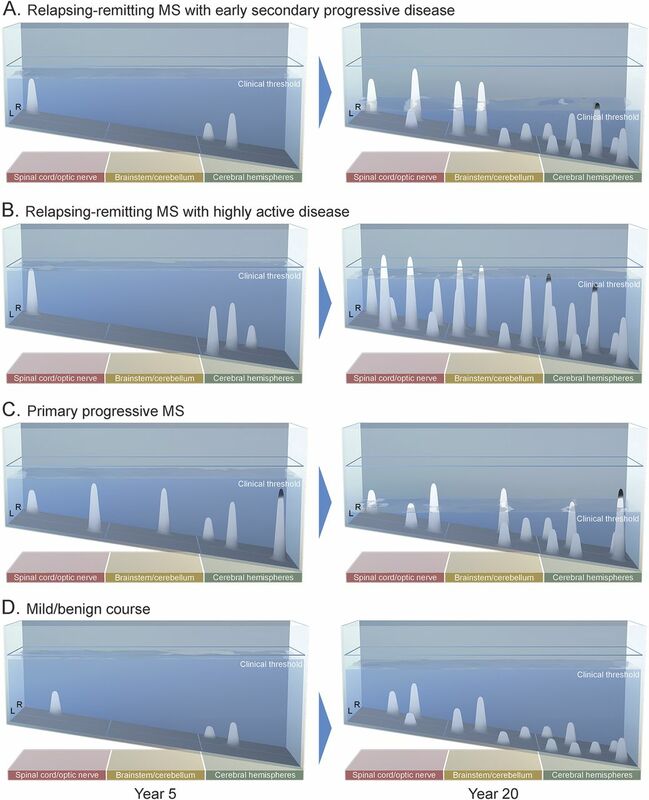 (B) Relapsing-remitting MS with highly active disease is characterized topographically by extensive clinical and subclinical inflammatory activity. Here, several lesions in the spinal cord and brainstem do not resolve below the clinical threshold, demonstrating lesions with high severity and low recovery capacity. (C) Primary progressive MS: several subthreshold lesions denote underlying disease activity, which do not cross the clinical threshold until functional reserve declines. Disability is driven here by the dropping threshold. (D) Mild course: no demonstrable disability is accumulated at 20 years of disease. All relapses resolve below the clinical threshold—demonstrating lesions with a high recovery capacity—and there is little depletion of functional reserve beyond that of normal aging. MS = multiple sclerosis. The prevailing view in MS clinical phenomenology is that relapses and lesions are focal events, whereas progression represents a generalized degenerative process. If this were strictly true, however, MS progression would presumably manifest as a largely uniform, symmetrical deterioration of upper motor neuron, visual, sensory, and cognitive function, akin to a leukodystrophy. In contrast, the clinical recapitulation hypothesis posited by this model is that the relationship between the inflammatory lesions that characterize relapsing MS and the generalized loss of functional capacity seen in progressive disease is such that the clinical signs and symptoms of a given patient’s progression principally localize to the multifocal lesions sustained from inflammatory disease activity. In this way, lprogression in MS manifests as a permanent, incremental recapitulation of prior relapse symptoms and an unmasking of previously clinically silent lesions. It takes into account that some lesions have more prognostic significance than others on the basis of localization. Lesions in the shallow end are more apt to cause the long tract motor or sensory symptoms that contribute disproportionately to MS disability accumulation. Conversely, lesions in the cerebral hemispheres, such as prototypical MS periventricular lesions, are depicted as arising in the deep end of the pool, as they are least likely to cause discrete symptoms by virtue of the depth of cerebral functional reserve and compensatory ability. While focal inflammatory lesions are depicted as topographical peaks rising from the pool base, the diffuse neurodegenerative process is depicted in this model by the water level’s gradual decline. This is congruent with emerging data on diffuse tissue loss and brain atrophy, which may be present from the outset of disease course,and may be the principal driver of disability during progressive disease. The model also incorporates the beneficial effect of large baseline brain volume, which has been shown to exert a protective influence in both cognitive and physical manifestations of the disease. It is important to note that the water in this model is indeed a depiction of functional capacity—physiology and structure—and not literally CNS parenchymal volume. As the relationship between focal inflammation and diffuse neurodegeneration, at the mechanistic level, has not been conclusively determined, in the model, the rate of water decline can be varied independently from lesion formation. However, as the recapitulation hypothesis of this model posits: even if relapse rate and lesion burden have no direct effect on the rate of loss of functional reserve, the topographical peaks, which are incrementally revealed as reserve is lost, are the loci of clinical progression. Thus, the model suggests that development of these lesions would more readily yield a progressive clinical course even without a direct effect on neurodegeneration itself. The crucial variable is the rate at which the threshold declines, as the loss of reserve determines whether these topographical peaks are revealed above the clinical threshold to a great or trivial degree. Conceptualizing MS as a unified continuum has implications for bench research. Studies seeking to identify biological differences between RRMS and SPMS, or primary progressive MS (PPMS) and SPMS, are inherently methodologically predicated on the assumption of discrete clinical phenotype categorizations. Thus, these studies may be looking for biological differences between categories that were not drawn along biological lines. It is worth noting that the depiction of PPMS in this model is concordant with the observation that the mean age at PPMS diagnosis is approximately 10 years later than in RRMS. The model does not, however, take a position on the primacy of inflammation or neurodegeneration: the model depicts topographical peaks beginning to form (“base effects”) and the water level beginning to decline (“surface effects”) simultaneously from the outset of disease. From a clinical research perspective, this could have bearing on how combination treatment strategies are designed, with a focus on combining therapeutics that work differentially on the “base” and on the “surface. A question would be is this form of model perhaps something that can be applied in time towards a more granular measurement of progression of symptoms? Ambulation, cognition, memory, etc. While I understand the "iceberg" type analogy there are many measures of progression. MSSS scale, EDSS, etc. etc. This model may form the basis of something that is very significant in bringing together all of these measurement mechanisms into a single summary that would be very important both in a displayable (understandable) fashion for patients and families but also perhaps in real-world clinical practice something of good usage/importance towards seeing and helping manage both symptoms and progression? I just wish there was more definite explanation and proof of WHY. And how to fix it all without a wrecking ball. I hope my neuro doesn't need pictures. But thinking about him… He might. Uhthoff phenomenon is the worst clinical aspect of MS. I accidentally urinated in my pants in this hot weather; I couldn't hold it and it crept up on me suddenly. How humiliating. Uhthoff phenomenon is horrible. It is terrifying. Yet no-one talks about it enough. Uhthoff phenomenon is seriously bad for MSers. I'd like this blog to discuss it, please.